Parmesan, pancetta and spinach stuffed chicken - home cooked food delivered. Impress your friends with this stress-free dinner party favourite. 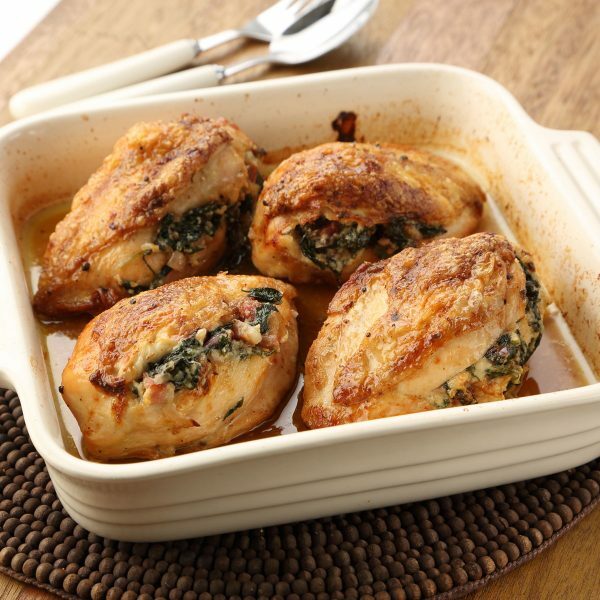 Plump chicken breasts, cooked to perfection and stuffed to bursting with crisp pancetta, two types of cheese and more. Chicken breast, fresh spinach, olive oil, pancetta, red onion, mascarpone (MILK), parmesan, chicken stock. Place chicken in a roasting tray, cover with foil and place in a preheated oven at 180 degrees for approx 15 mins. Ensure product is piping hot before serving.